Want to add a little shade to your relaxation time? Our Treasure Garden AG Series Cantilever 11' Octagon Patio Umbrella offers a substantial amount of coverage for your outdoor environment. At 11', this cantilever umbrella easily shades a very large dining area or your upscale deep seating set. This high quality umbrella is both sturdy and durable designed to endure from season to season and with its wide variety of fade resistant colors this patio accessory will coordinate beautifully with any outdoor decor. This patio umbrella has full 360 degree rotation along with a built in light adapter to fit Treasure Garden umbrella lights adding an elite touch. 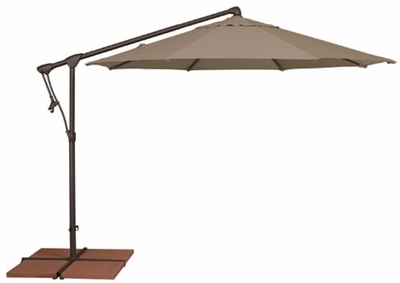 This is a superb umbrella that will add sophistication and style to any open-air space. * Shade Size: 10' ft.
* Weight: SWV: 52.0 lbs. * Pole Diameter: 2.7" in. * Coverage: 79 sq. ft.